The Cañada College Transfer Center recently hosted three Open House events that served more than 200 students who needed last-minute support with their UC and CSU transfer applications. During these sessions, students were able to drop in during extended hours for help with questions ranging from how to get a fee waiver to a review of their Personal Insight Questions. This was especially helpful to students who were navigating the new CSU application system. The event was a collaborative effort between multiple members of the Counseling Department, including Transfer Program Services Supervisor, Soraya Sohrabi as well as Counselors James Aganon, Lyn Belingheri and Nadya Sigona. 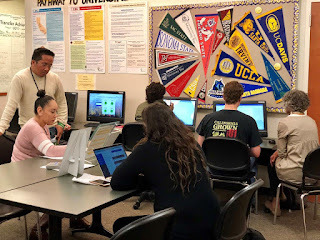 In addition, all Counselors helped students during their individual appointments, whether it was to review applications or the Personal Insight Questions. Every piece contributed to the overall result which was to assist students to successfully submit their transfer applications.